The Crested Gecko was thought to be extinct at one time but is today one of the most popular lizards in homes as pets. This lizard is very easy to care for, but of course, you will need to learn how to care for a lizard properly if you want a happy and healthy pet. The origin of the Crested Gecko is the islands of New Caledonia, which are found between Fiji and Australia. There is only type of crested gecko even though in the family of geckos there are several different species. 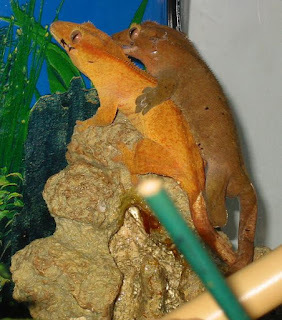 The crested gecko family includes leopard geckos, skunk geckos, fat tailed geckos, Tokay geckos, house geckos, golden geckos, day geckos, and Madagascar ground geckos. The crested gecko can grow to around 17 inches long and is mainly green with very noticeable ridge with pointed scales beginning above the eye and going down the crown onto the back. For one gecko, you will need a ten-gallon aquarium. If you have more than one of course, you will need a larger environment. The lid should fit snugly and the bottom should have a substrate such as dried leaves. They do enjoy hiding so make sure you have plenty of things for them to hide inside even an old box will do. The temperature of the aquarium should be 72 to 80 degrees Fahrenheit with humidity around 70% to 80%.DietGeckos need a balanced diet of plants and animals in order to stay healthy. On their own they eat a variety of figs, insects, snails, birds, rodents, small lizards, berries, and flowers. Geckos are natural hunters so they will certainly enjoy crickets, but also like baby food which may be the best way to give them the fruits they a balanced diet. A few great baby foods items to provide your gecko would inlcude banana, peach, papaya, chicken, and turkey. Male geckos are territorial and will no do well with other male geckos, but females do well living together. Crested geckos are prone to dysecdysis, which is the inability to shed, metabolic bone disease, and diarrhea. In most cases, dysecdysis is due to dehydration or low humidity whereas the bone disease is brought on by lack or dietary supplementation, and diarrhea is also brought on from their diet. Life expectancy is normally more than 15 years when cared for properly.